Resident Evil: The Final Chapter (2016) is a rated R 1h 46 min sci-fi action-horror-thriller that was everything I expect it to be. Director/producer/writer Paul W.S. Anderson (Death Race (2008), Resident Evil (2002), AVP: Alien vs. Predator (2004), Resident Evil: Afterlife (2010)) did an excellent job executing this final film to the Resident Evil movies. The story was thought-provoking, and I am ecstatic that Paul decided to go against the series usual storyline and give us a few character-driven elements. The movie contains suspense, action, gore, violence, frightening scenes, intense horror, the female protagonist, virus, zombie, post-apocalypse, dystopian, monster, and explosions. Resident Evil: The Final Chapter was a wonderful treat that satisfies its fans with an action-packed adventure that will not be forgotten anytime soon. Resident Evil: The Final Chapter starts where its predecessor film, Resident Evil: Retribution (2012) stops. Alice (Milla Jovovich - Resident Evil: Apocalypse (2004), The Fifth Element (1997), Resident Evil: Extinction (2007), Resident Evil: Afterlife (2010)) is seen heading to Raccoon City. She is on one mission, and that is to get rid of the evil corporation that turned her environment into a chaotic zombie mess by infecting humans. Alice did not realize that her mission is about herself and not just about humanity and doing what is right for humankind. I was amazed to see the truth behind Alice’s existence unravel as the movie progresses. The final showdown is something that should receive your undivided attention because Alice joins with a few faces she knows and does not know to get rid of the Umbrella Corporation. 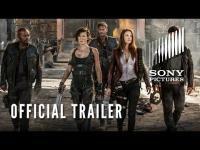 Action fans will be very pleased with this movie even if you are not a Resident Evil fan because the film is filled from the beginning to end with brilliant action packed adventures. One of my favorite scenes is when Alice was seen dangling from an overpass. Milla Jovovich gave us an incredible performance as she plays Alice. A part of me does not want to say goodbye to the series because I want more. Almost everything was excellent about the movie including the fantastic cinematography, sets, lighting effects, sound, editing, and makeup. Avg. Rating: 3.1/5 stars from 70,009 users.